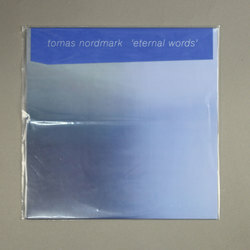 Tomas Nordmark - Eternal Words. Vinyl LP. Bleep. Hailing from Sweden via his adopted London home, composer and sound artist Tomas Nordmark’s poetical new age nevertheless seems emitted from a deeper corner of outer space, an alien transmission confounding science in a holistic embrace. Taking cues from American minimalists like Terry Riley and Steve Reich, Eternal Words takes their less-is-more ethos and finds a tonal complement in Scandinavian deep disco. Nordmark’s spaced angle is profoundly human; fleshy and earthbound on ‘Giving’, strangely pious on the intergalactic hymnal ‘Human’. This is a keenly optimistic work for dark times, created by a mind on scorched earth, always looking up.